In the past few years, credit card fraud has been a major concern for both consumers and credit card companies worldwide. In the US a 2010 study showed 32% of credit card users were victims of credit card fraud. That was significantly higher than the 27% the year before. Because of this, credit card security has been on the forefront of many financial discussions. In many countries overseas, credit cards have adapted for more security. 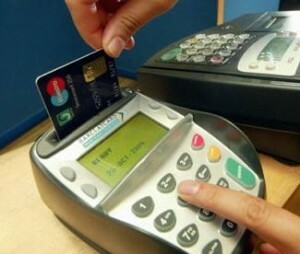 The conventional swipe and sign credit card has been replaced with a chip embedded technology. The chip-n-pin card doesn’t have a magnetic strip. Instead an embedded chip is read at the register and the user enters a pin number to complete the transaction, much like you would with a debit card. For many travelers this was an inconvenience. Now the headache can end as the US is now getting these chip-n-pin cards. Conventional credit cards are flawed. With the ease of theft and use, there is no way to stop a thief from using your card unless you cancel them. Even with many companies requiring cashiers to check identification when credit card purchases are made, human error can occur. If a thief gets their hands on your card, they can charge away your financial security. With the new chip-n-pin credit cards, the embedded chip contains the information and a pin number is required before any purchases can be charged to the card. This will allow more security as thieves won’t know the pin number. Therefore it can be stolen as it will be useless to anyone who doesn’t know the pin. Currently only Chase and Wells Fargo are offering a version of the card that is both readable via the embedded chip and able to be swiped via the normal magnetic strip. This will be advertised toward those who spend a lot of time traveling abroad. That will allow normal use here in the US and chip-n-pin purchases overseas. As the US adopts the new technology, the cards will evolve and be distributed without the magnetic strip. This will offer more security for those who count on their credit cards for emergencies or everyday purchases. While traveling, they will find the convenience of utilizing the technology that is currently in use in many overseas countries such as most of Europe and Asia, and many countries in South America. Credit card fraud is an epidemic that many companies are battling. With so much money lost to thieves, they are working harder to bring a solution to their members. The new chip-n-pin technology may be that solution. If you travel abroad you will find relief in knowing the new cards are on their way. Andrew Bennett is a financial consultant and advises his clients to obtain credit cards for bad credit in order to increase their credit rating.